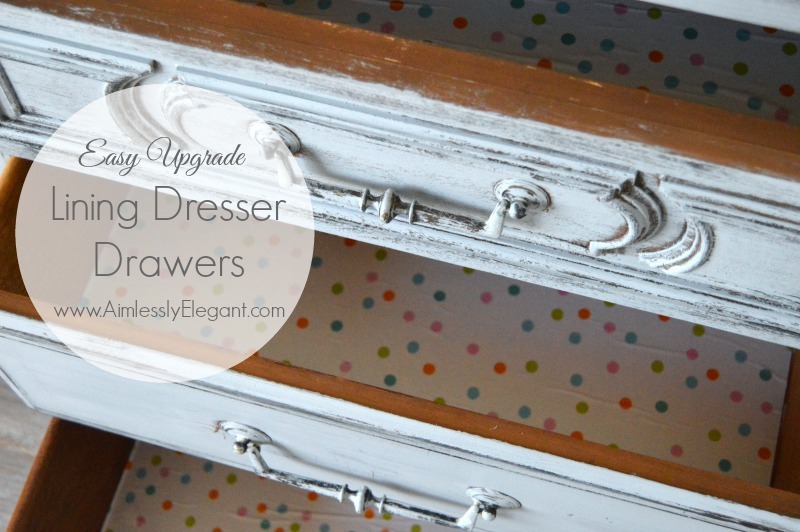 Today I'm stopping by with a super easy upgrade, that really you could use to dress up any piece of furniture that has drawers or shelves. My intention this last weekend was to get started on the window seat area of the nursery, but my lack of energy got the best of me and I decided to tackle a simpler project instead. 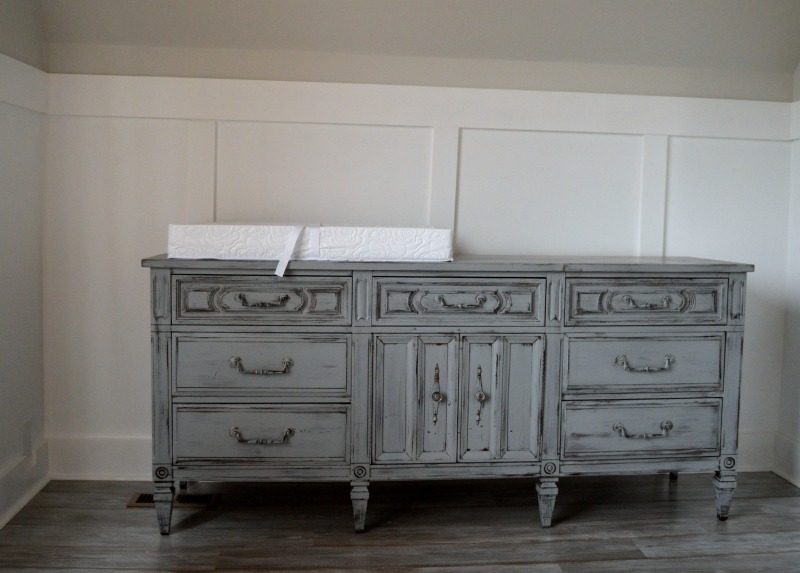 Last week when I revealed the nursery furniture you saw a glimpse of the dresser we scored off of Craigslist that will also be doubling as a changing table for the first few years of our little ones life. I really wanted to do a little something to spruce up the inside so it felt a little nicer, especially since the outside had been upgraded. Even though it's an older piece of furniture, we were lucky in that all the drawers were still solid and functioned properly. But it definitely had that older smell whenever you opened all the drawers. A little trick to getting that out is to take some vinegar and a cloth and wipe down all the drawers. Once the vinegar evaporates you can no longer smell the vinegar, or the old smell. 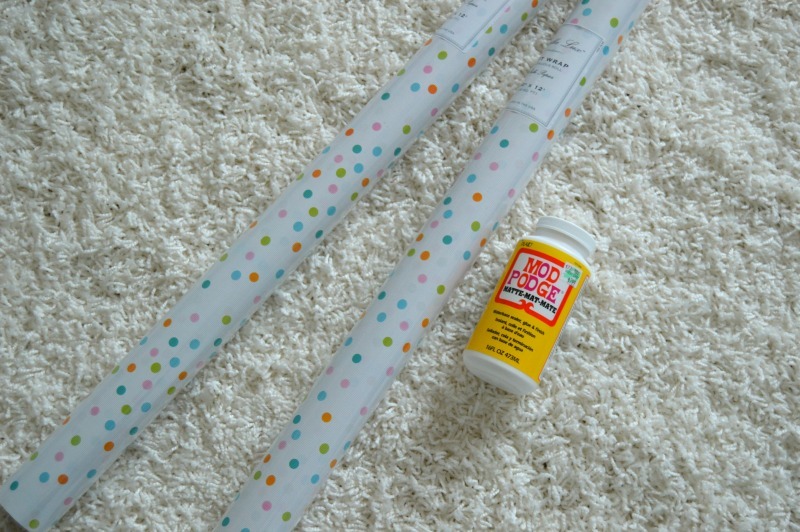 I picked up a few rolls of wrapping paper at HomeGoods for $2.99 a piece. In hindsight, if I had measured ahead of time I would have only needed one roll, but it never hurts to have some extra when you are going into a project. I love the wrapping paper you find at HomeGoods and TJ Maxx because not only is it super cheap and cute, it's also usually the thicker more heavy duty stuff. Once I had my wrapping paper, the only other supplies I needed were some Modge Podge, some craft brushes, and something to measure with and an exacto knife. I started by measuring the inside foot print of my dresser drawers. Luckily I had 7 of them that were the same size, and 2 of another size. Then I just used my ruler and exacto knife to cut the pieces out of the wrapping paper. Once all the pieces were cut, I went drawer by drawer brushing on a layer of Modge Podge and then smoothing down a piece of wrapping paper into the bottom of the drawer. I'll admit I'm no Modge Podge expert and my pieces of paper didn't necessarily go down completely smooth. I tried, and I smoothed and I smoothed, but I still ended up with some air bubbles that turned into wrinkles. I decided it just gives it the vintage look, right?! I did find though that if I was a little too light handed with the Modge Podge I'd tend to get more bubbles and wrinkles then if I applied it a little more liberally. Once all the pieces had been set in the drawers, I started back with the first drawer and applied a thin coat of Modge Podge over the top of the paper to seal it down. All in all from start to finish the whole project probably took me about 2 hours to complete. 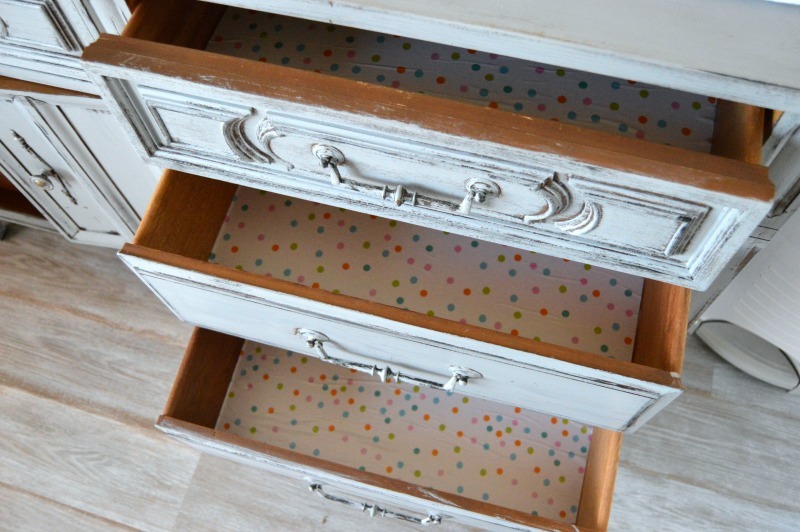 I love the little fun pop of whimsy it adds whenever the drawers are pulled open. Now to start stocking the drawers with all the little baby goodies! Here's to hoping I have enough energy this weekend to tackle the window seat, I think I'll be good! 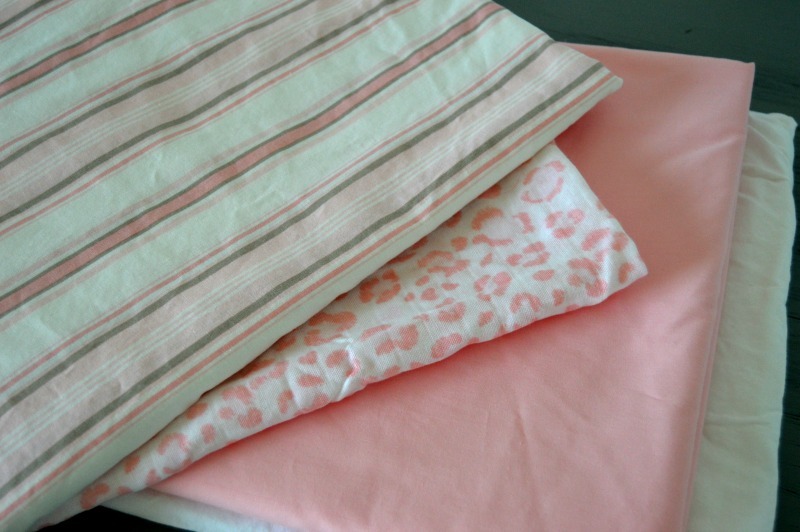 And a little preview of the fabrics I've picked out for the project. I'm really starting to feel like we're on a time crunch now, only 2 months to go!